Looking or that special Christmas gift during the holidays? Does that important person in your life desire the best life can offer? Consider the new Premier Delicate Silk Automatic 36mm luxury watch collection from Harry Winston. The iconic House of Harry Winston is one of the most respected jewelry brands in the world. The company’s history is illustrious. The luxury brand was founded back in 1932 in in New York City by Mr. Harry Winston. They are makers of some of the most beautiful and stylish luxury fashion products found anywhere. This automatic Ladies watch has 36 mm round 18K White Gold & Diamonds case. The watch features a gorgeous diamond-set bezel. A master embosser at Harry Winston discovered a way to stamp the 18-karat or 22-karat gold design into the raw silk. As a result, the material delivers a stunning sense of both depth and volume. It’s simply beautiful. Since the 1989 introduction of the Harry Winston Premier Timepiece Collection, jewelry aficionados are aware of the distinctive diamond-set lugs that attach the case to the bracelet. The shape matches the well-known arched entrance of Harry Winston’s Fifth Avenue Flagship Salon in New York City. As the holidays quickly near, maybe your wife or girlfriend would just love receiving a beautiful timepiece like the Premier Delicate Silk Automatic 36mm. They will love the 18-karat white and rose gold watch, that includes 57 brilliant-cut diamonds on both the bezel and lugs. 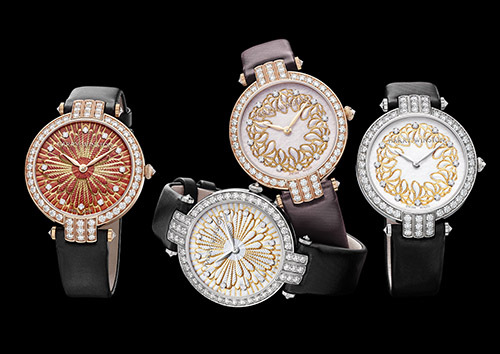 The pink and white silk dials will feature 12 gorgeous diamond hour markers. For ultimate reliability, the Premier Delicate Silk Automatic 36mm luxury watch by Harry Winston is powered by a high-end Swiss automatic movement. The gold ardillon buckles are perfectly set with 17 brilliant-cut diamonds, located upon a satin strap. This luxurious watch collection is made in very limited quantities. Only 30 pieces are available for each watch model. <h2)The new Harry Winston Premier Delicate Silk Automatic 36mm watch collection is visually stunning. If interest, please contact us today. Enjoy more news in the luxury watch industry and follow our luxury blog. It’s time you live a luxury lifestyle!